The North Gate is an essential components of the medieval fortifications of Athenry. The walled town is one of the most intact examples of its type in Ireland, and survives in various states of repair. Altogether 500 metres of town wall, the North West Tower & Guard House and the South East Tower have been repaired in nine phases since 2008. The town retains almost 1.5 kilometres of the original wall that once extended to 2.5 kilometres in length. The wall is a National Monument and along with the rest of the town is included in the Record of Monuments and Places (RMP ref. no. GA084-001) and as such are protected by the National Monuments Acts, 1930 – 2004. The town walls are a Protected Structure, and help define the extent of the Athenry Architectural Conservation Area. The North Gate is listed as Gazetteer Number 5 in the appendix to Athenry Town Walls- Conservation & Management Plan prepared by Gifford Ltd. for Galway County Council issued in July 2008. More recent expansion of the town has extended northwards from the historic core where the railway station is now situated. Unlike the southern stretches, were encroaching development has been much lighter and less intrusive, the northern section is now surrounded by later development much of which is privately owned. 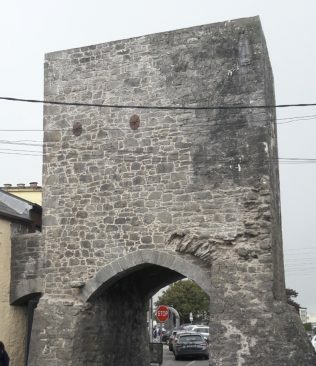 The North Gate is situated at the end of North Gate St. and is the sole remaining entrance gate into the historic centre of Athenry, and is the most visible landmark of the structures located along the town wall. At present, it is an important part of the one-way traffic management system in the town as one of the exit points. Unlike the towers at the corners of the walls, the North Gate is rectangular in plan, with a tall room over an arched passageway that once held a portcullis and still retains its murder hole. It is approximately eleven metres high, seven metres wide (east to west) and five metres deep (north to south). The arched passageway is under four metres wide and nearly four metres high in the centre (just over two and a half metres at the springing point of the arch). There are three openings on the facades; slot windows to the north and west and one to the east that was added more recently. It is built of coursed limestone rubblework with ashlar quoins and voussoirs to the pointed arches. The ashlar stonework is part of later repairs, the remains of the original arch are visible to the south side with protruding voussoirs to either side. The underside of arched passageway bears traces of wickerwork centering close to the murder hole. There is no direct evidence of the original town wall on the sides of the Gate. There is a slight batter from the top to the base of the tower, the eastern side is built out with rubble stonework, perhaps buttressing the Gate following the removal of the town wall to provide clear passage either side. There is a small arched section between the Gate and the front of the building lining the west side of the street; this is a later addition, possibly nineteenth century, and may provide bracing to the Gate. Details of repointed and consolidated stonework. Details of arch fragment following repair. The tenth phase of works to the town walls, commenced on site in early August 2018, with a 6-week programme, including three weeks of a road closure to allow access to the arch and vaulted room. 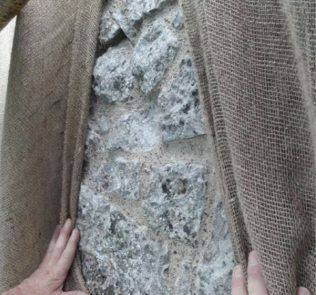 Works were prioritised in the following order: health and safety, integrity of the monument, protection. This translated in the works programme to- treatment and removal of vegetation and embedded roots; consolidation and repointing the west and south facades which had not been rebuilt in the 1970s. The main contractor was Joe Costello T/A Stonemad while the Architects were Howley Hayes Architects. 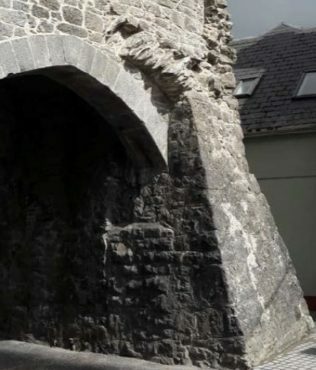 The project was funded by Galway County Council and the Heritage Council through the Irish Walled Town Network. This page was added on 20/09/2018. James Hack Tuke: Quaker Philanthropist and Friend to Ireland’s Poor.